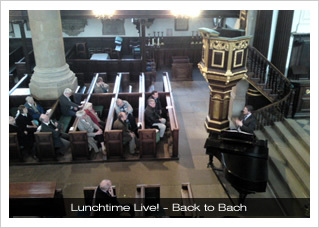 With an average attendance of 120, the Director of Music's series of lunchtime lecture-recitals "Back to Bach" reached their fourth instalment yesterday as nearly 170 people heard him perform J. S. Bach's Toccata and Fugue in D minor, BWV 565. These recitals include a spoken introduction to the work being performed, and yesterday Mr Dunleavy talked about the nature of a Toccata - with extracts of Widor and a more "touching" Toccata (di ‘durezze e ligature’) by Frescobaldi - and illustrated how a Fugue works (and why there is "subdominant" in this particular Fugue). In addition he explained some of the suggested attributions for the piece - was it by Bach at all - and put forward the various arguments for it actually being for violin, or lute, or even five-string cello. The recital began with a rather straight-laced performance of the work, followed by the talk, and the recital ended with a second performance of the work where there were more effects, ornaments and dramatic pauses in evidence. 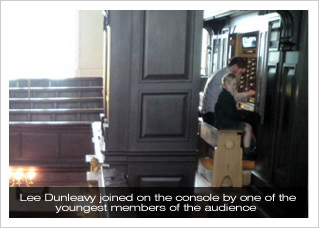 For the second performance he was joined on the console by one of the youngest member of the audience (see photo below), who sat spellbound by the movements of the keys and pedal. More details of the series - the next recital is on Thursday 1 April at 1:10pm - and can be found by visiting the 'Back to Bach' page. Our Lunchtime! Live summer series "Queen of the Instruments" is now fixed, and programmes are beginning to appear on the web-site. 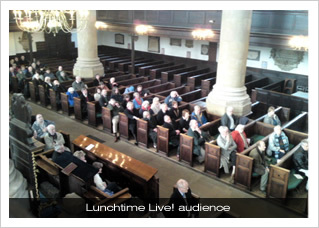 For more details of this series please visit the 'Lunchtime Live' page. The 2009/10 series of recitals concludes with a "requests" recital on Thursday 22 July given by the Director of Music. 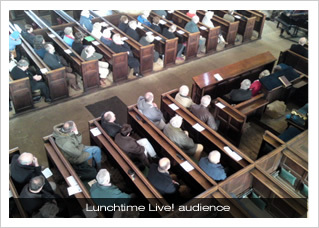 To request a piece for this programme please e-mail the Director of Music before Easter Day.